Hello ladies! It's been a few days, I know- I've been meaning to make a post, so now I am! 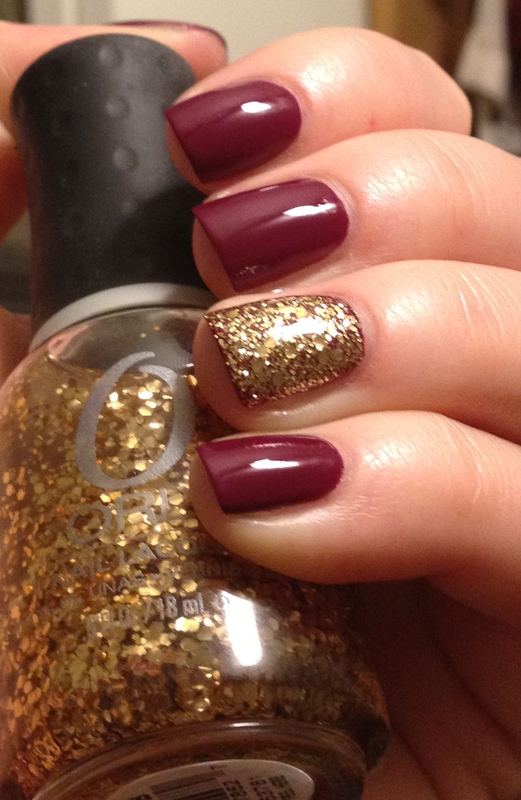 On another note, I've thoroughly been enjoying the Autumn season, especially the nail polishes that tag along with it. My favorite colors are definitely dark berry/wine/red colors. I feel like they are classic and go with every fall-inspired outfit! Today I am using a gorgeous polish in that color family- Nails Inc. Piccadilly Circus! They are so lovely both of them, and they work perfectly together! The glitter is very pretty and it looks very nice with nails inc colour. Thank you, Amber :) I thought so too! This is so pretty! I was thinking of doing something similar for Thanksgiving! i like this accent nail combo! I'm Shelby & I'm a student majoring in loving my boyfriend and minoring in obsessing over nail polish. I hope you enjoy my blog! Essie Leading Lady Collection Picks! OPI Uh-Oh Roll Down the Window & Glow Up Already!